The Holidays are here and its that time of year. Moomas is right around the corner! Called the Establishment of the Celestial Cow. A time of celebration, feasts, and gift giving. Not unlike the mainstream faiths of the season. One of the things that we would like to do for this holiday season is offer special Moomas Cards! The designs were donated by A’Aqytsekhmet for the holiday season. They are available to be downloaded and printed out. We do ask for a small donation for the chance to have these cards. Whatever you can afford would be greatly appreciated. The images below are numbered and titled for easy picking. If you would like to have all four designs we would suggest a donation of $10 or more to make it fair to the artist and their donation of their time. Once you have made your donation please email the ‘receipt’ to fundraisers@kemet.org and please note which design you like. The cards will be emailed to you in attachment as images. They are made for 8.5×11 paper. There are two cards per paper so you can cut them in half and have folding cards to write personal messages. All cards will be sent at the end of each work day so that everyone receives them at once. Thank you for your patience! AS A SPECIAL MOOMAS SURPRISE!! 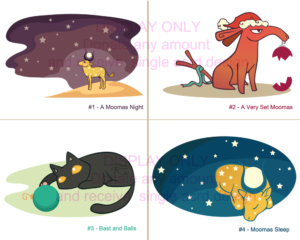 For a special moomas surprise A’Aqyt has agreed to create 5 custom cards for the people who donate $25 or more. The custom image will be sent to you for your own use and the card file will also be sent for you. If you got a slot but want to donate the image for public card use you can do that as well and be our Secret Card Cow. Due to the time and effort put into the cards there are only 5 slots available at this time. Please Donate first then send your ‘reiceipt’ to fundraisers@kemet.org. Make sure to note that you would like to create a custom card with your donation. Also make a note about which Name you would like featured in your image or other detail you would like included, such as a greeting. Should more spots be needed or the artist has the time they can be opened up. Just keep an eye out on the forums.